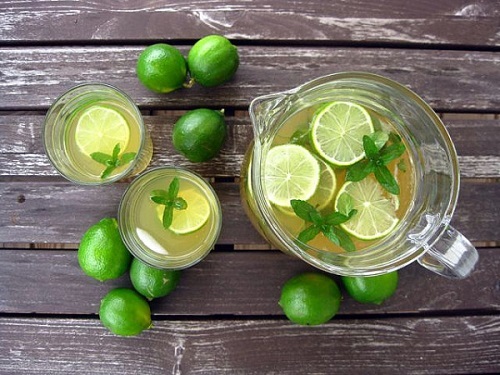 Green Tea is the star of the show here as its antioxidants aids in speeding up the metabolic rate resulting in fat being burned even when you’re not active. It also re-hydrates the body and improves the immune system. Mint not only gives water a cool, crisp refreshing taste but it’s also a calming, soothing herb that’s been used for centuries to aid upset stomachs and indigestion. It’s believed that mint improves the flow through the stomach which helps speed and ease digestion. Lime also aids in digestion as its acidic juices breaks down food while stimulating the digestive system and increasing digestive fluids.